Recently, a worker fell about 30 feet from scaffolding while working outside a building in Fort Lauderdale. The worker reportedly landed on his feet in a sandy area and was taken to the hospital complaining about back pain. This construction accident is the latest in a string of accidents involving scaffolding that have occurred in our area this year. A worker had to be rescued in Key Biscayne while dangling from his harness after a scaffold collapsed. Another worker was taken to the hospital in critical condition after falling off the 7th floor scaffolding at a Miami Beach condominium. And tragically one worker died after falling off scaffolding at a South Beach condo. Injuries from scaffolding accidents range from cuts and bruises to broken bones, concussions, traumatic brain injuries, head and spine injuries and even death. Scaffold must be sound, rigid and sufficient to carry its own weight plus four times the maximum intended load without settling or displacement. Scaffold must be erected on solid footing. 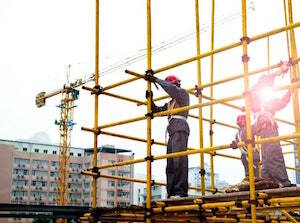 Once scaffolding is erected, it must be inspected not only daily but also before each shift to make sure connections are tight and that the rigging is undamaged. You can read the complete list in the OSHA Construction Pocket Guide. If you or a family member has been injured in any type of premises liability accident or personal injury, please contact the Law Offices of Diana Santa Maria, P.A. immediately. Our experienced attorneys will fight for the compensation you deserve. Please call us for a free consultation. Attorneys Diana Santa Maria and Laura D. Dolin, personal injury attorneys in Fort Lauderdale, will fight to secure justice for you and your family. You can reach us at (954) 434-1077 or contact us via the website.